Are there any conversations you will always remember? Are there people in your life that you think everyone should have the pleasure of knowing? 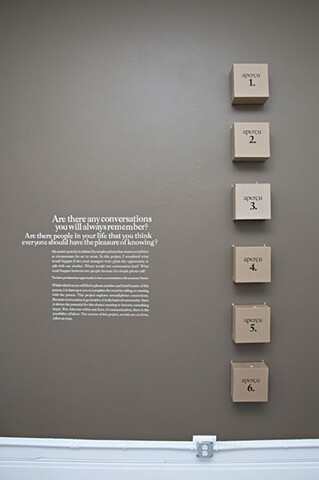 This project is defined by simple actions that create a condition or circumstance for art to occur: I wondered what would happen if two total strangers were given the opportunity to talk with one another. Where would one conversation lead? What could happen because of a simple phone call? With the purchase of a box, you have the opportunity to have a conversation with someone I know. Within the box you will find a phone number and a brief dossier of this person; it is then up to you to complete the work by calling or meeting with the person. Success depends on trust.